Wn67 Les Moulins - Saint-Laurent-sur-Mer, K.V.U. Gruppe Percee, Normandie. 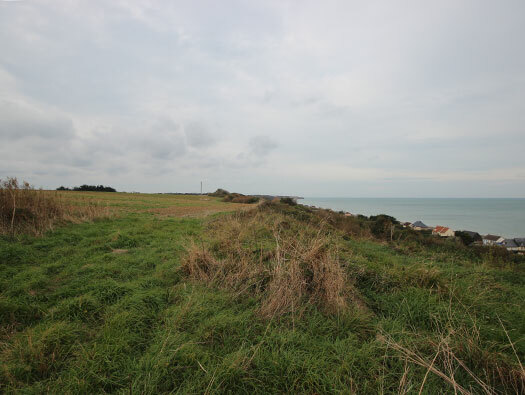 Set behind Wn66 is Wn67 and comes in two parts, the first part is the flat land behind the protection of the ant-tank wall with an under-construction area of casemates and the second part is up the 30meter grass covered cliff with mortars, trenches and machine guns. Wn67 middle ground and the top of the cliff. Wn67 from the top of the cliff. 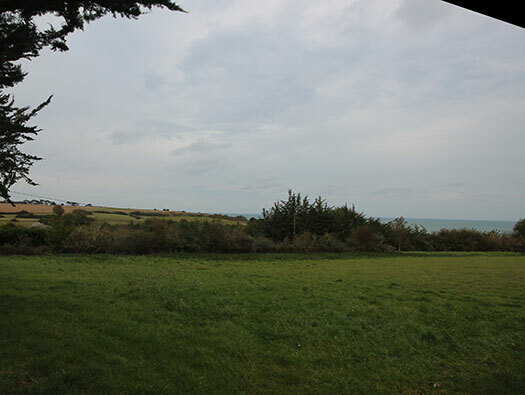 The area covered from the cliff top, down to the flats. 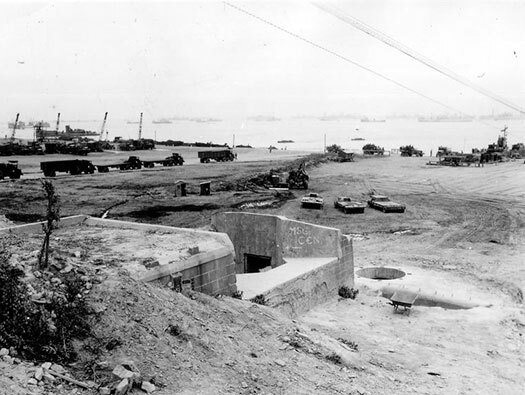 This picture is about 1942/3 just before real fortifications work started. 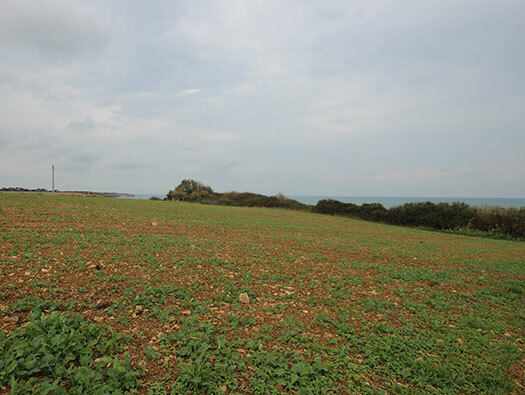 The original part of the Wn on the top of the grass covered cliff with a horse shoe defence and two Tobruk's covering the rear. On the west rear side is a machine gun emplacement which is a type that seems to be in several of the valleys here. 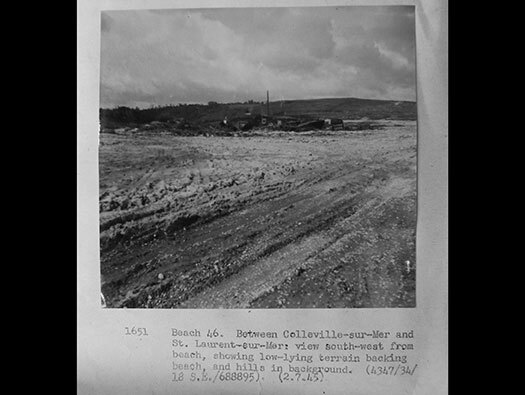 Over to the east side are two mortar Tobruk's with 81mm mortars, machine guns and observation post. 1 x Wooden observation for FluWa (Luftwaffe). 1 x Wellblech shelter for the above. 2 x Ic125 mortar Tobruk's. 1 x APX R35 3.7cm KwK144(f) coaxial MG. tank turret. 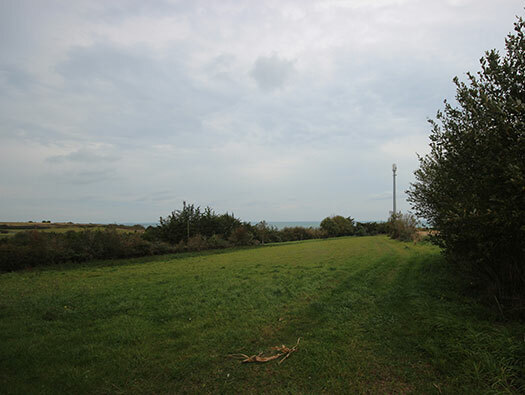 1 x 5cm KwK (un known where it was. 1 x 8.8cm Pak 43/41 not in casemate but was in a field position and would have been moved into casemate R677..
1 x 7.65cm F.K.17(t) set up on the cliff above and would have moved down to the casemate R602. Many field positions for s.MG. & MG.34. The second area down on the flats behind the anti-tank wall. 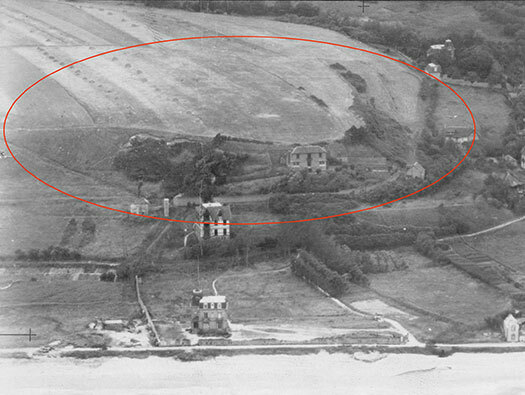 1 x R677 casemate the 5cm gun may have been in another field position, there seems no information about where it was. 1 x VK3001 tank turret 7.5cm KwK37 coaxial MG.34. Ic125 mortar Tobruk for an 8.14cm Gr.W278(f) mortar. R677 casemate for an 8.8cm Pak 43/41. R612 casemate for an assault gun, here a 7.65cm F.K.17(t). (APX R) R35 3.7cm KwK144(f) coaxial M.G.311 (f)..
Wn67 sat back from the sea on the 30meter grass cliff with MF (mine fields) 39 & 40 covering the beach. Mine laying on the beach. Tucked behind the tank wall this defence would have been quite formidable. the construction site of about four individual positions. The first is a BF246 for a VK 3001, a 7.5cm tank turret ringstand. Then there is a Type 1694 ringstand for a 5cm KwK fitted between an ammunition square bunker and the 246 ringstand. 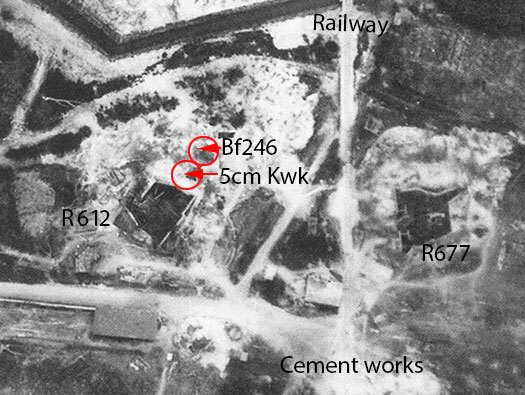 To speed up production of bunkers they changed the way they were building them from wood shuttering and poured concrete on steel mesh reinforcement to Bauform brick and then filled in with steel reinforcement, poured concrete, and you can see the brickwork showing up in the picture. VK 3001 7.5cm tank turret awaiting placing in its ringstand. Nr1694 ringstand with a high wall on the sea side and an ammunition room on the land side. 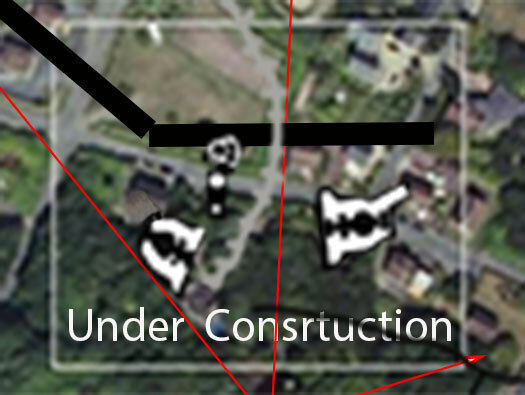 Behind again under construction a Field Kannon firing < west in an R612 casemate, Then an 8.8cm Pak gun sweeping for a long way down the east> side. The ammunition storage here would have been a nightmare with two types of mortars, two types of 7.5cm shells, 8.8cm shells, 5cm shells and maybe even 3.7cm shells plus any machine gun ammunition of probably three types.. 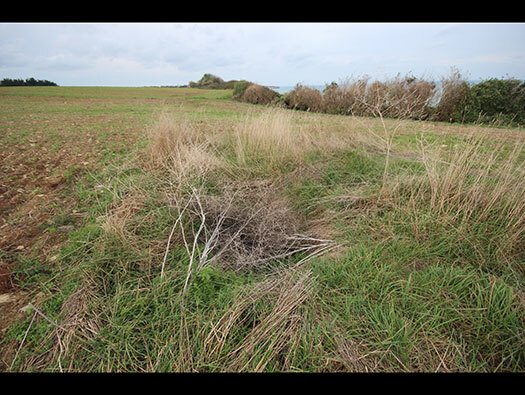 Behind the two ringstands (pointing west) an R612 casemate for a 7.65cm F.K.17(t) (Field Kannon) which was found smashed up after the battle on the top of the hill and (facing east) an R677 for an 8.8cm Pak 43/41. 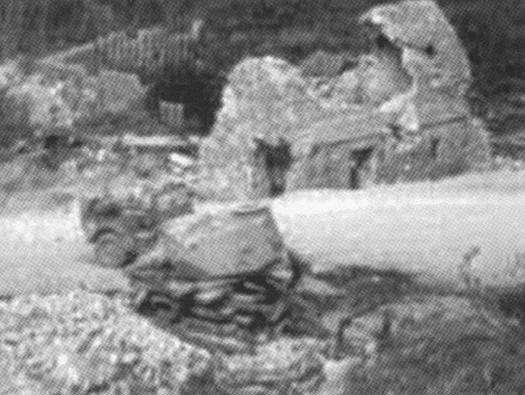 The 8.8cm Pak 43/41 may have also have been there set up close to the cliff for protection. R612 for an assault gun an 7.65cm F.K.17[t]. Field Kannon, usually a captured piece. This one was a Czechoslovakian (t). A horse drawn model gun. (7.65cm could be classed as 8cm). A Tobruk for a VK 3001 tank turret on a BF246 emplacement. I have seen two pictures of this 7.5cm tank turret sat on railway sleepers like this picture (which I made up to show what it was like). 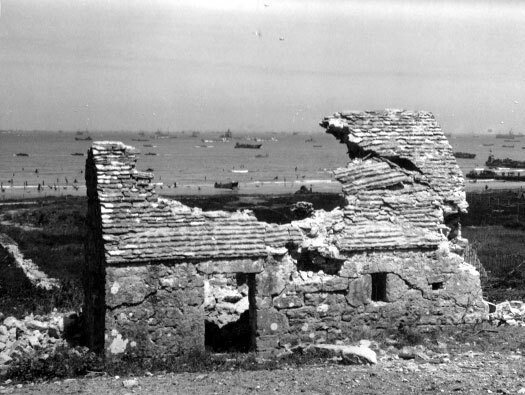 One picture is in Alain Chazette's 'Omaha Beach' page 60 sitting in front of the damaged house below. (I cannot use his picture but its like this one). The other I cannot find anywhere??. A 7.5cm tank turret would have fitted onto the concrete hole of a BF246 ringstand. VK 3001 tank turret in another position on Omaha beach. 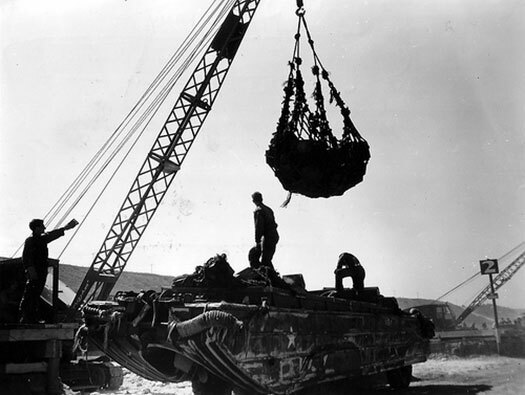 Sitting where the camera man is stood was a VK 300.1 tank turret (can be seen in Alain Chazette's 'Omaha Beach' page 60) ready to place into the ringstand. Turret taken from a VK 30.01 (H) Panzer VI (H) Heavy Tank. 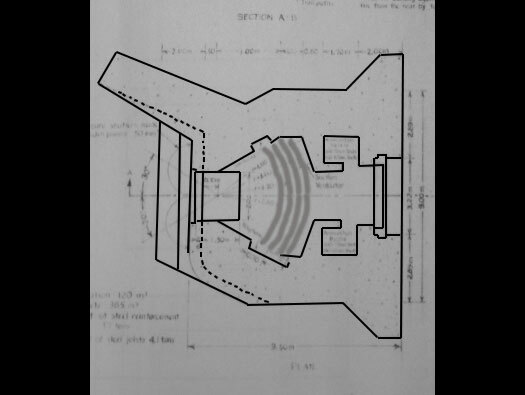 I have found it, this is the picture I was looking for, its the VK 3001 tank turret for the BF246 emplacement, ready to be fitted. 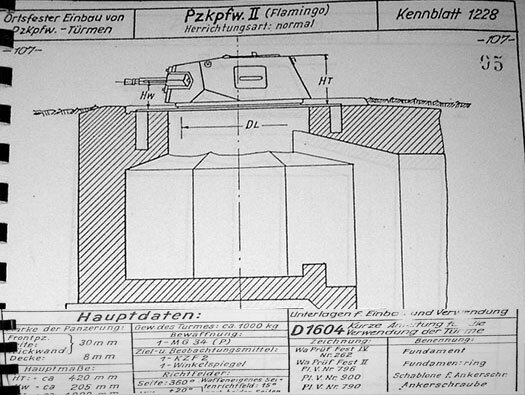 VK 3001 tank turret in Wn68 on Omaha beach and this is how it would have looked. Another photo taken from a different angle, the VK 3001 tank turret for the BF246 emplacement, ready to be fitted. Now up on the top of the 100ft/30m grass covered cliff. The start of Wn67 driving up the track looking north, here may have been one of the Tobruk's and there was another to the left in the next field. Looking along the cliff edge a grass cliff of about 100ft/30meters high. This is where the two mortars of 8.14cm Gr.W.278(f) in Ic125 mortar style Tobruk's. A wooden observation for a Luftwaffe group of FluWa an air observation group of about three men on duty. They could also man machine guns in the beach defence.. They also had a Wellblech shelter to live in. There was barbed wire, a few machine guns and mines, hundreds of mines littering the side of the cliff and along the top, nasty little ones that can blow a leg off. 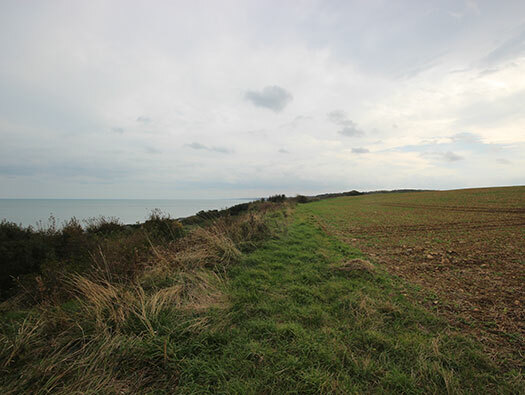 Below on the cliff were laid mine fields. 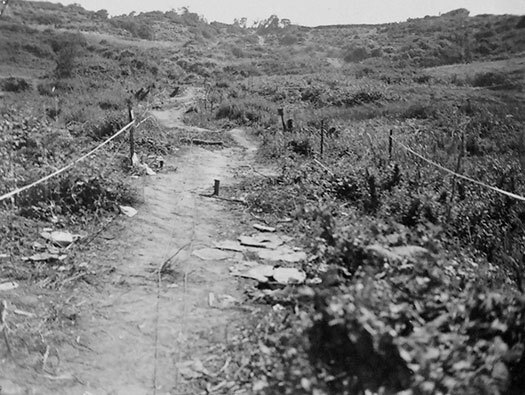 The Americans climb the cliff further along and pass by the top and then start to take machine gun fire from the guns of Wn67. 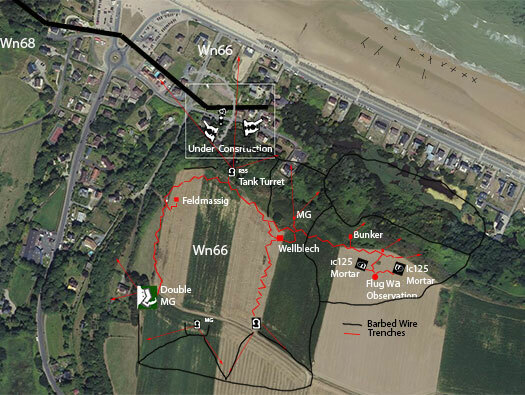 Gradually one by one each machine gun and infantry man is either killed or captured and Wn67 was captured. 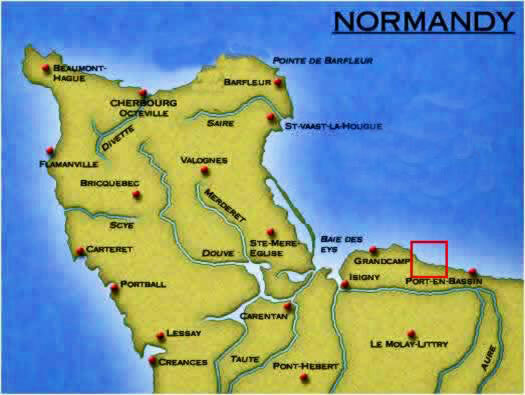 They do lose several men to the mines but by 12.00hrs so many Americans were climbing the cliff and passing through here and on to St-Laurent-sur-Mer and inland. Woking up the grass cliff. I think this is the site of the FluWa Luftwaffe unit a small group of Airforce coast watchers, looking out for Allied planes. They would notify Luftwaffe HQ as a back up for radar sites. 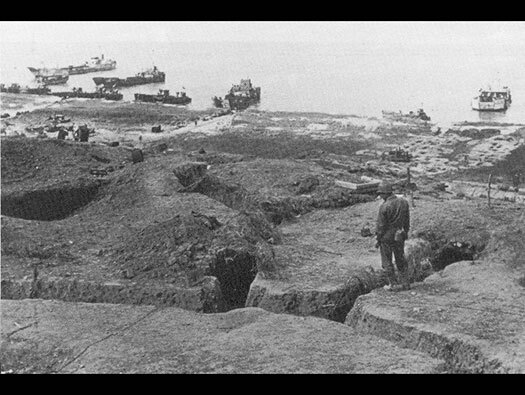 Trenches on the top of the cliff. Here machine guns could sweep the beaches. The site probably of more trench systems. This is the corner above the valley to the left and sea in front. Somewhere here is/was the twin machine gun position bunker. 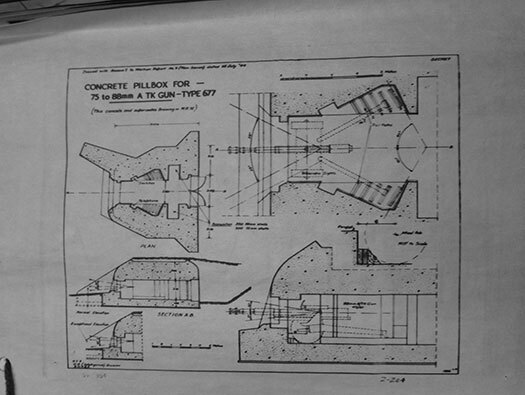 Plan of the twin machine gun bunker. The landings. Men started landing after 6.00am on a tide just about turning and starting to come in. The defenders held their fire as ordered too. 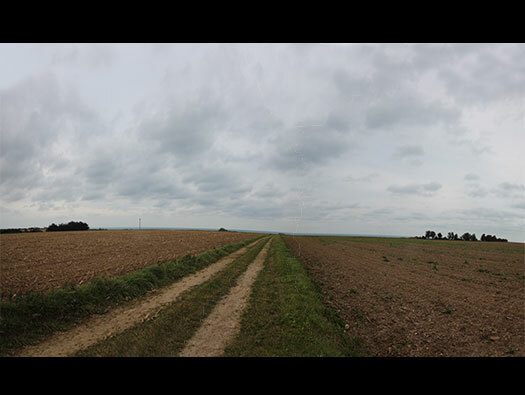 The firing started when the Americans reached a certain point probably marks out on Rommel´s Asparagus. 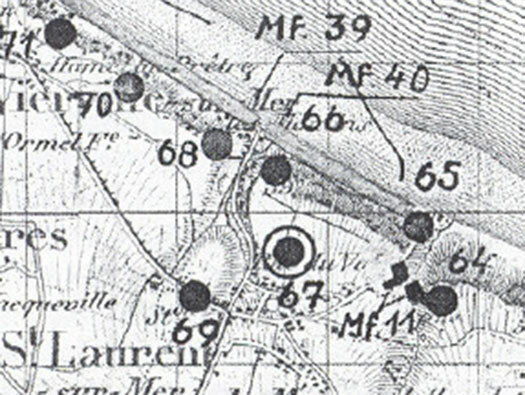 The machine guns hit them very hard due to the bombing being ineffectual and the pre landing shelling not heavy enough. 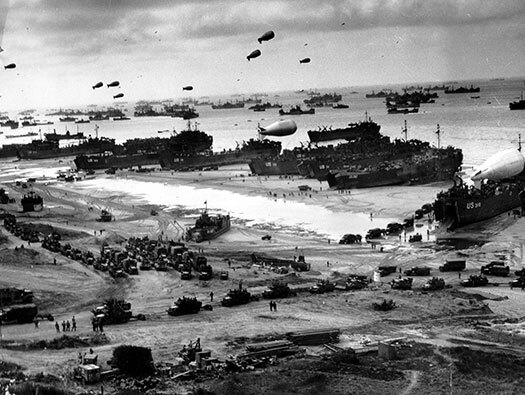 The men were stuck on the beach and could not advance across the hail of machine gun bullets flying around, mortar and artillery shells raining down. 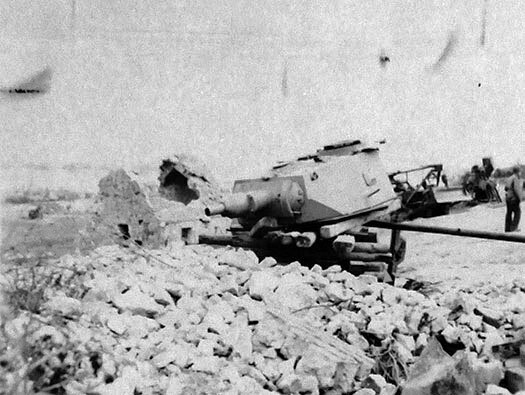 Tanks arrived but most were hit by the anti-tank guns. As the time went on more troops arrived and managed to get up the grassy cliff between the defences and attack them in the flanks. Taking out the machine gun fire and capturing their positions. 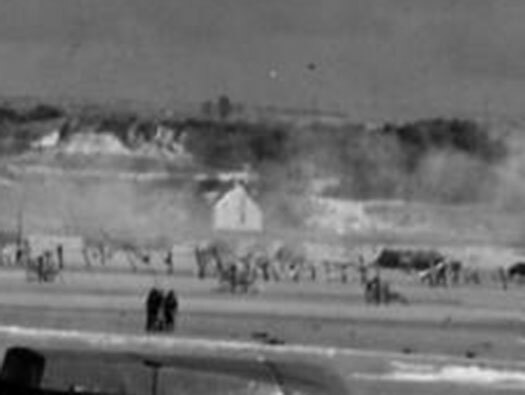 At about 11.00am the defenders were convinced that they were winning, artillery was still firing, mortars were putting down a heavy stonk on the beach. Plenty of machine gun ammunition and the rifle men were getting a lot of practice. Then gradually the artillery were running low on ammunition and the bombardment started to ease off and then troops that landed crept up to the flanks and started to engage the Wn's. 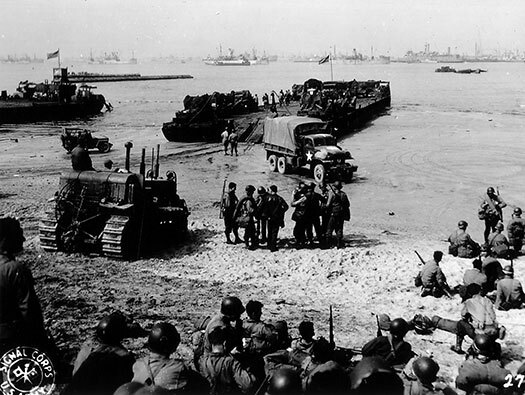 By 12.00 the tide was almost in, more tanks had landed and were taking on the anti-tank guns. 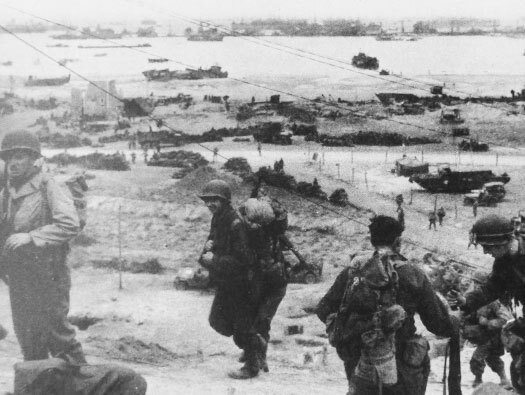 By 17.00 most Wn's had been captured and the anti-tank walls blown up and cleared, infantry were moving inland and by 24.00 the battle for the beach was literally over. The ascent up the from the beach to the top of the cliff through the mine field.. 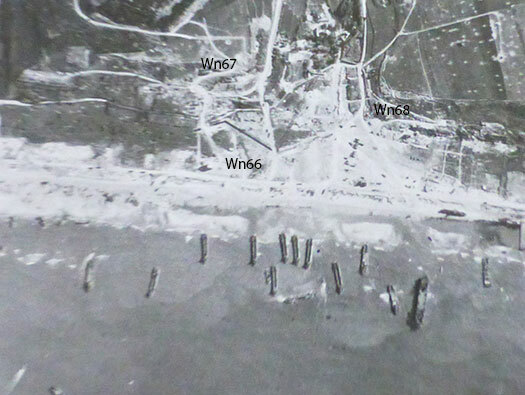 This picture just shows how Wn67 was completely ploughed up after D-Day. 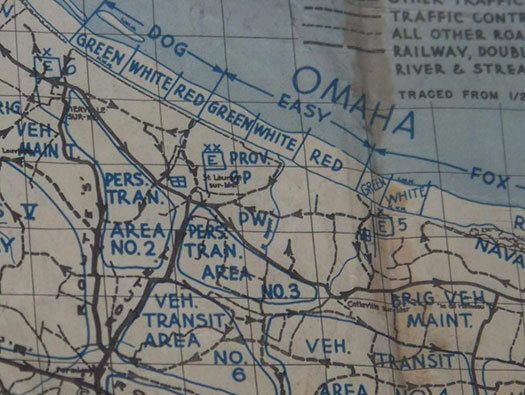 This is a plan for the build up showing vehicle and personnel transit areas and also PW (POW) camps. The white mark on his helmet means he is part of the Beach Party. His job would be to help organise the beach head. A Rhino craft off loading, these craft could hold a massive amount of vehicles and were powered by two very powerful outboard motors. Ideal for moving from ship to shore. 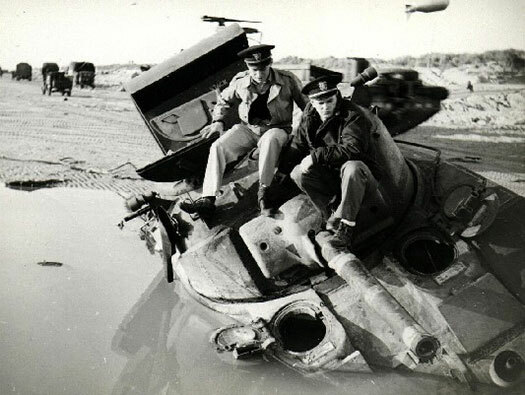 Damaged Sherman on the beach. Fitting the exhaust wading trunks.